Home » Featured » What is CRM in Real Estate? No Comments on What is CRM in Real Estate? 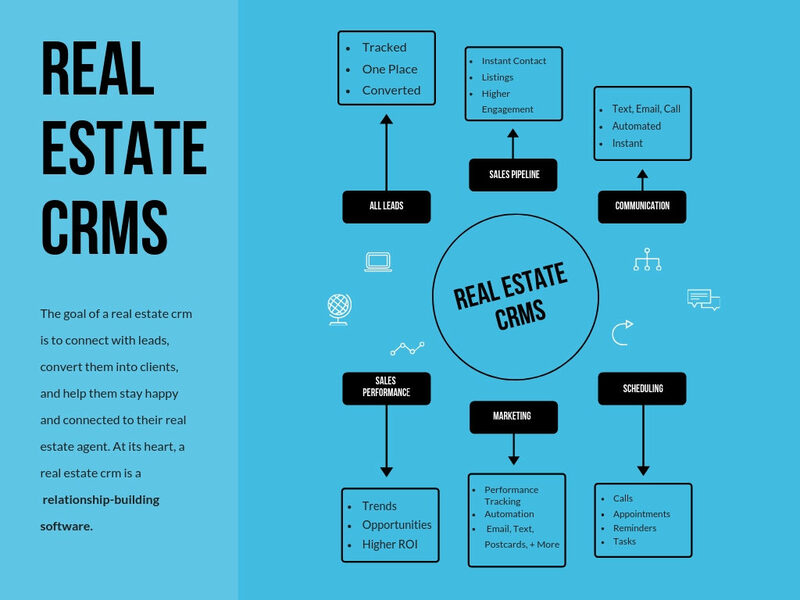 The “crm” in real estate crms stands for “customer relationship management.” At it’s most basic level, a real estate crm is a type of software that helps real estate agents grow relationships with leads, clients, and past clients. The goal of a real estate crm is to connect with leads, convert them into clients, and help them stay happy and connected to their real estate agent. At its heart, a real estate crm is a relationship-building software. How does a real estate crm work? Since real estate crm systems are designed to build relationships with leads, clients, and their real estate agents every task they perform should tie into that mission. But what exactly do crms do? If an agent were to sit down and log in to a real estate crm, what could they actually do with it? The answer is, “it depends on the brand.” However, there are some key functions that any real estate crm worth it’s salt should perform. In today’s world of Zillow, social media, and purchased leads, a crm is very important because it takes all of a real estate agent’s leads and stores them in one place. Real estate crms import leads from any source (Facebook, Zillow, etc.) Then, it tracks every lead on their course to becoming a happy client. The bottom line is that every agent and brokerage wants to improve their sales rates. Crms help real estate agents by converting leads into clients more quickly and effectively. Forbes reported that 71% of online leads are wasted because too much time lapses before reaching out. Real estate crms reach out as a lead is generated, sending personalized texts and emails and alerting the agent to call and make personal contact asap. Conversion rates are improved with features that send personalized listings via text or email to home buyers. With agents being strapped for time, there are not enough hours in the day to contact every lead, client, and past client on a regular basis. Real estate crms help agents close more deals by contacting leads and clients automatically on their behalf. There a number of ways they can do this including texting leads listings and sending emails and drip campaigns to large groups of contacts. Real estate crms are often good at helping real estate agents identify opportunities to convert leads while they are hot. Many real estate crms will show these opportunities to the agent, identifying the hottest leads, encouraging agents to redouble their efforts, and reach out personally and strike while the iron is hot. Many crms can also help identify how effective certain automated communications are, allowing agents to refine their messages to get greater lead conversions. Another way that crms help agents build relationships is by scheduling phone calls and appointments with leads and clients. A real estate agent can use a crm to stay on top of business. Crms do this by making sure agents make personal contact with their leads and contacts when they need to. Many crms also integrated with any agents preferred calendar method (iCal, G-Suite, etc.). Many crms allow agents and teams to track the performance of sales. This allows teams to delegate leads, track follow-ups, conversions, and sales. Team members are more accountable, and individual agents can track metrics to see how to improve their personal conversion rates. Real estate crms also help agents with their marketing efforts. The most important way that they do this is by tracking the effectiveness or performance of each step of marketing campaigns. Agents can easily see if their efforts gained any traction. CRMs allow agents to see how effective their efforts actually are and help them refine their marketing messages, timing, and placement for better results. Real estate crms allow agents send mass emails to selected groups of leads, clients, past clients, or colleagues. Most also have text messaging capabilities that allow agents to target leads and clients with tailored text messages. Postcard campaigns are also easy to manage with crms which allow agents to easily export every address from one easy-to-use place. Crms are also great because they help real estate agents stay in touch with past clients. Need to send a birthday card to a past client? A real estate crm will remind an agent on a yearly basis when to make contact, what the past client’s address is, and any personal references to include. Real estate crms also allow agents to send out email newsletters, seasons greetings, and scheduled check-ins (like “how are you enjoying the new home?”) with past clients. Not many, but some real estate crms also offer integrations with IDX listings. 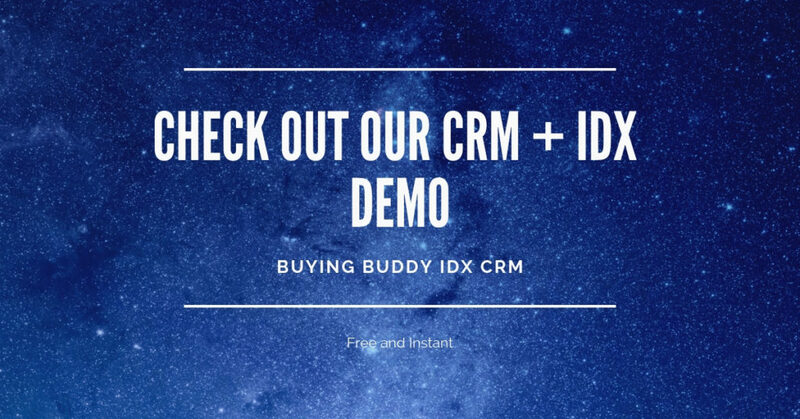 Real estate crms like Buying Buddy CRM IDX allow agents to pull leads directly from their websites. They do this by not only recording the lead’s contact information but also by capturing all of the lead’s home search history from the IDX. This allows the real estate agent to gain a new lead with an entire search history. Now that we have answered the question, “what is a crm in real estate?” it is important to pause and talk about what a real estate crm is not. Because of vague explanations and misguided marketing some real estate agents have purchased real estate crms expecting them to do a totally different set of jobs. Real estate crms are a relationship-building software between leads, clients, past clients and their real estate agent. Many times, what an agent might really be expecting is an office management software instead. When they purchase a crm, they envision opening a product that will help them automate their office workflow including payments, paperwork, and daily tasks. If this is the case, the agent really needs real estate office management software and Capterra put together a great list of top-notch options. Many real estate products have also been slapping the term “crm” onto already existing software as an afterthought. These faux crms do not have the capabilities of a true real estate crm because they don’t allow agents to import all of their leads, they don’t have mass communication capabilities, or they only manage leads but not current and past clients. Examples of these faux crms can be found when purchasing leads from companies (because they won’t let you import other lead sources), some auto-dialer companies, and some even real estate office management software. The key is to purchase a real estate crm that specializes in just that: real estate crms. When asking the question, “what is crm in real estate?” the answer will widely depend on who you ask. But any real estate crm worth its price should help agents by importing every lead (no matter the source), improve their sales pipeline, send auto-communications, track sales performance and identify opportunities, perform scheduling functions, be an indispensable part of their marketing efforts, keep them connected to past clients, and in some cases, even generate new leads. At it’s heart, a real estate crms are all about building relationships between leads, clients, and past clients and their real estate agent.